Description: “Wrong” or "Distortion". That is the title of my artwork The reason I chose this title will be explained further in the description. The dimension consists of an A3 (42 x 29.7 cm) size. As for the media, the idea will be translated through pen and black ink with hints of colored marker in order to emphasize important points on a plain white cardboard. The technique includes lines and shading while the style a simple monochromatic drawing, so as to not to distract the viewer from the message of the artwork. Statement (message): In “Wrong”, there are two main statements that translate into one message that is, the media distorts the image of what the Islamic religion actually practices, and that that action is simply wrong and immoral. The word, Islam, is directly linked to salam, which means peace in the Arabic language. And so, that is what the artwork depicts. It depicts how our [the Muslims] practice of peace is almost never conveyed to the world of non-Muslims. This project could not have come at a better time since now is the moment for us Muslims to prove just how much this is all getting out of hand. The reason for that is of course, the most important and respected news channels solely focus on the groups of people who gather in the “name of Islam”, such as ISIS, Boko Haram and Hezbollah. With that said, the majority of non-Muslims in our world have been building an image of modern day Muslims but built upon what they hear and see in the media, which ultimately brainwashes them into thinking that all Muslims are basically terrorists and are interested in taking innocent lives during the course of their “Islamic-driven” actions. I want this artwork to relate to all of us. I want it to bring light on one of the main aspects of Islam, which is peace and serenity. Islam is not about war and bloodshed and hatred like what most people think who are base their opinion on what the media portrays. Islam is not about killing and lying and doing horrendous things “in the name of God.” Islam is not about telling the world that non-Muslims deserve to die. No. Even from an inner mind perspectives, Muslims do not pray to Allah five times a day do not do so in order to pray for hardships towards someone else, for that act in itself is considered haram (a sin). With that said, I would like to add that “Wrong” is also meant to highlight a personal level of victimization. As in, when somebody feels like someone else has twisted their words or actions around so that they could look bad, or just the idea of random rumors being spread by a person. In this case, the media is playing that role but on a much more intense level as it is a worldwide effect rather than personal. But then again, personally, it hurts to see how bad the media tries to make Muslims look, well, basically insane. Surely, I know who I am, yet I have this sense of unfairness being pointed my way because I know that it is easy for people to believe what they hear and see and make their own judgments but it takes effort to actually get to know what real Muslims are like. The fact that I know if non-Muslims take their time to actually study the different types of Muslims there are and realize that the media is either conveying the extremists or a type of Muslims that do not even exist. They would see how much the media is trying to separate us from the world as make us look like we are the ones who are the root of all evil. “Wrong” is packed with symbolism. I tried creating a soft connection to satirical cartoons that have become so popular among our generation with actual drawings. 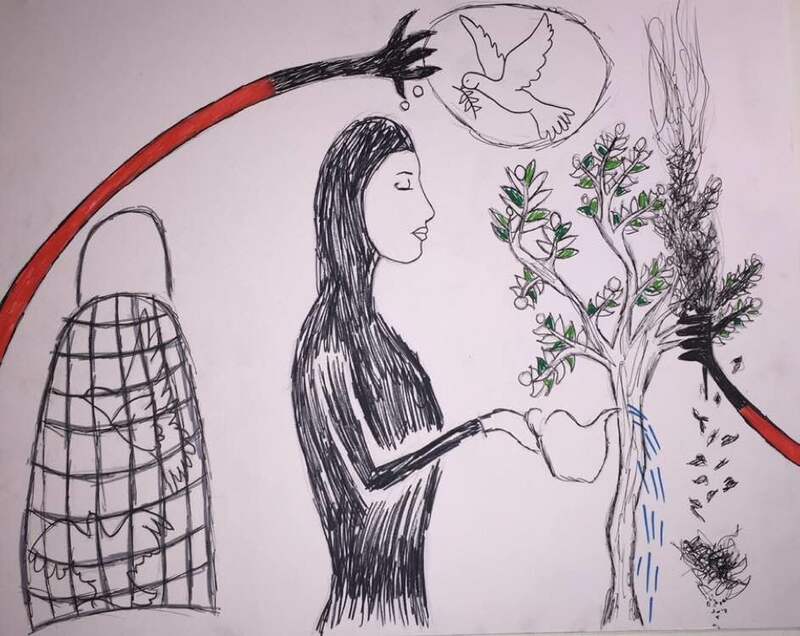 The drawing consists of a woman in a abaya and hijab, she will be symbolizing modern Muslims who have hearts of peace. She will be seen watering the Olive tree, which is a symbol of peace. It is mentioned more than once in Qur’an and linked to peace. The watering of the tree is meant to convey the Muslims longing and desire for peace with other religions and cultures. In some way, the Olive tree can represent the religion itself, as in “Islam” linking to “Peace”. But on the other side, is a mysterious red arm with gloves so as to not leave any marks or prints leading back to them, that is burning that side of the tree with a torch. And so the first statement referring to distortion is portrayed here. Another area of attention is towards the woman, representing Muslims, thinking of a white dove, which is also symbolic of peace universally. This emphasizes on how Muslims do not only believe in actions (watering the tree) but also in psychological state of mind (thinking of the dove). Therefore, it is within our culture to love peace. But while this dove carrying the olive tree is situated stably in her mind, a hand is reaching out to seize it in order to place it in a cage along with other doves captured previously. This is what the media wants to show. The hand is also covered by glove to indicate the coward approach to portraying Muslims. In addition, this arm is stretched out is drawn out to be anatomically impossible for two reasons. One, to show that whoever is controlling the media has such immoral intentions to a point where I have a hard time believing that they are human. Two, to convey how much trouble they are going through just to make Muslims look like terrorists. They literally go out of their way and say preposterous things to make us look bad. And it is all just so wrong. Origins of the Idea: The idea came to me right after I thought I had a concrete idea for what my art project was going to be about, even after I mentioned it to my professor. Once I took the time to go over what previous students had done for this project, I was drawn to the ones that screamed out a powerful message. I realized I did not want a peaceful looking portrait, as I cannot relate it to what I feel inside. What I feel inside towards this particular subject is frustration. So this drawing actually helped me to pass both a message and feeling that his been inside me for a while. Even the way that the majority of social media reacted to Paris bombings and shootings in comparison to the reaction the Lebanese bombings received two days prior is sickening. It just portrays how narrow minded the majority of non-Muslims are in this world because of the media and that they now relate ARABS to ISLAM whereas in reality, they are not directly related. There are Muslims from all over the world, not just Arabic countries. The idea of “Wrong” is to point out all of this negative energy the media throws on Muslims. Influence: With reference to the idea itself, there was no specific artist that influenced me. It was an inner feeling that came out as an epiphany right after I thought I decided on another final idea. And so, it was a quite impulsive idea. The fact that I wanted to translate it into a drawing is actually from a previous student’s artwork. In interest of the student, I will not name them in case it is not in their preference to be named. It is not a direct influence but the monochrome scheme of the photo allowed the message to be more powerful as there was nothing else that the viewer can focus on other than the message itself, which was beautiful. Also, I traced the source of a shirt I liked on the Internet. It read “Don’t be a media puppet” from cafe press (I will attach a reference link for the website). The shirt added inspiration to the powerful message I wanted to portray as the drawing is also meant to support being open-minded and not believes everything you see or hear on the media. Short Biography: My name is Lora Angelica Mohty. I am from Lebanon and have lived in the United Arab Emirates for roughly 17 years. I am currently majoring in Interior Design. If you rewind a couple of years from now, when I was in about the 5th grade, I remember the media being a normal type of thing. Literally, I recall that older student and members of my family were not so hyped about the news. But we watched it all change suddenly and that had a strong impact on me. The way that anything can change any second and the fact that that happens mostly in situations where you have no control at all made me realize how fast and easily people’s minds can be swayed. Recently, I have been becoming more aware of what is happening around the world and paying more attention to issues that I would have turned a blind eye to. Now, I can completely understand why my parents spend so much time watching the news on Arabic countries. It is either to be aware of what is happening in their homeland and what is near it on Arabic media, or to laugh at the lies or shows that are put on by the monster that is the Western media.